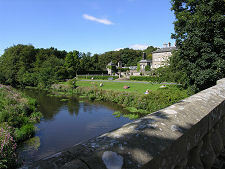 Pollok House stands close to the north bank of the White Cart Water as it flows through Pollok Country Park. 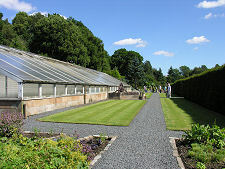 The surrounding landscape gives every appearance of being open countryside, yet Pollok House is just over three miles south west of Glasgow city centre, and Pollok Country Park lies immediately to the east of the M77 and entirely within the built up area of the city: the park is also home to the Burrell Collection. The Maxwell family have been established in this area since Sir John Maxwell settled here in the mid 1200s. Generations of Maxwells followed, the first-born son usually being called John, until Sir John Maxwell was created the 1st Baronet by King Charles in 1630. In an unusually confusing twist, a second 1st Baronet (or 1st Baronet of the second creation) another Sir John Maxwell, was created by Charles II in 1682 after the original 1st Baronet had died without successors. 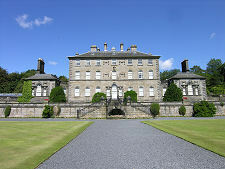 It was this latest Sir John Maxwell's cousin, who succeeded him to become the 2nd Baronet, who commissioned the building of Pollok House in 1747. It was completed in 1752, a few weeks before the 2nd Baronet died. 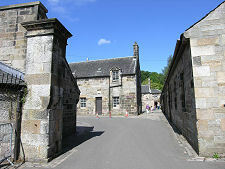 The Maxwells had not been homeless prior to the building of Pollok House. It is thought they had previously built a series of three castles in the immediate area. The first of these, probably dating back to the mid 1200s, is associated with a motte in the rhododendron garden. And the next, with origins in the late 1400s, is thought to have been on a site close to the river, where the stable block stands today. Given the typical development of Scottish castles, it seems reasonable to assume that the third castle was a development of the second in the 1500s or 1600s, and on the same site. Nothing remains of these earlier castles: the stone used in them was doubtless recycled during the building of Pollok House. 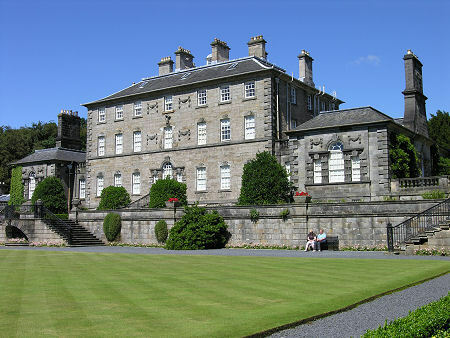 As completed in 1752, Pollok House comprised a single main block, seven bays (and 80ft) wide and three bays deep. The identity of the architect is unknown. William Adam was said to have drawn up plans for a house in 1737, but the style of what started to emerge when the funds were available a decade later suggests the house is unlikely to have been built to his plans. The original building largely survives as the main block of the house you see today. Externally it was fairly plain except for some decorative stonework either side of the central windows on the south side. 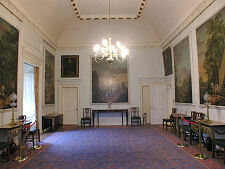 The interior was another matter, with highly decorative plasterwork in most of the main rooms. This is thought to be the work of the Clayton family, who also did the plasterwork at about the same time at Blair Castle in Perthshire. In 1865 the 8th Baronet, yet another Sir John Maxwell, died childless. The baronetcy passed to his nephew, Sir William Stirling of Kier, who subsequently took the name Sir William Stirling Maxwell. Sir William had tried and failed to gain a seat in Parliament in the 1840s and instead set out to travel Europe. He became fascinated with Spain, and in 1848 published his three volume history of Spanish art, Annals of the Artists of Spain. 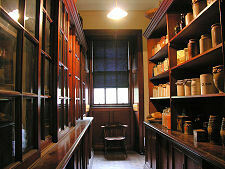 By 1865 he had built a large collection of Spanish works of art, part of which remains on view today in Pollok House. Sir William Stirling Maxwell died in 1878, leaving two sons aged 12 and 10 to be brought up by an aunt as his two wives had already died. The younger son went on to inherit Sir William's estate at Kier, near Dunblane, while the elder, perhaps inevitably called Sir John Stirling Maxwell, inherited the baronetcy (becoming the 10th Baronet) and Pollok House when he reached the age of 21 in 1887. With an estate on the edge of a rapidly growing city, Sir John became a leading light in Glasgow's society and a very wealthy man. His father had focused his attention on the family estate at Kier, so Sir John inherited Pollok House very little changed from when it was originally built. The house was not large enough to house his share of his father's collection of paintings and the library that had been housed at Kier, so he brought in the architect Robert Rowand Anderson to design a sympathetic expansion of the house. Various options emerged, including plans that would have produced a much larger house than you see today, with the height of the central block carried round to large wings either side and advancing to the south of it. 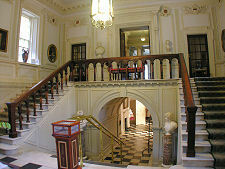 In 1890 a new entrance hall projecting from the north face of the central block was begun, as was a large new service wing extending to the west of the house at basement level. But the extensions to the main house which were built in the very early years of the new century turned out to be much more modest than the initial plans, with single storey pavilions being added to the east and west of the existing building. 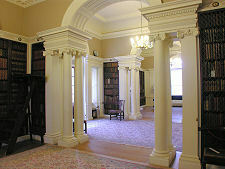 The east pavilion was designed to house a library of 7,000 books and has been described as the finest 20th century library in Scotland. Today it retains its original use: and its original design, being divided into three by sets of Ionic columns. The west pavilion was designed to balance the library at the other end of the house with a billiard room. 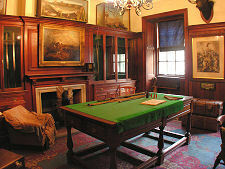 During the first world war the house became a hospital and the billiard table was moved into the library. 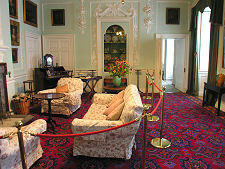 After the war the west pavilion became first a sitting room and then a dining room. In 1931 Sir John Stirling Maxwell convened a meeting at Pollok House that led to the creation of the National Trust for Scotland. He died in 1956, within a week of his 90th birthday. In 1966 the 11th Baronet, his daughter, Mrs Anne Maxwell Macdonald, gave Pollok House, the art collection, the library, and 361 acres of surrounding land, to the City of Glasgow. 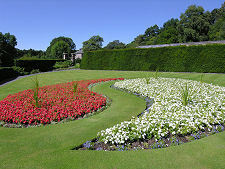 In 1998 management of the house was passed to the National Trust for Scotland by the City Council. Today the 700 year old link with the Maxwell family continues: they retain accommodation within the house for their use when in Glasgow. The 21st Century visitor can enjoy the Country Park for its own sake, or can visit the Burrell Collection. 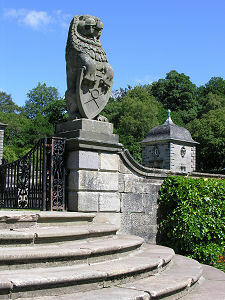 But the focus of the estate remains Pollok House itself. On a sunny day this provides a glorious backdrop for those walking beside the White Cart Water, while a little upstream is a water-powered sawmill and nearby stable block, complete with some impressive resident heavy horses. 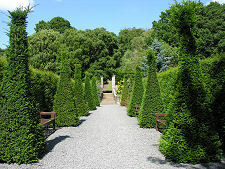 There is also a series of elegant and beautifully maintained gardens to enjoy. 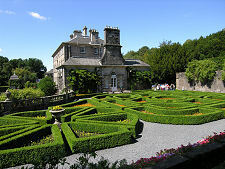 Apart from the lawns to the south of the house itself, most of the gardens extend eastwards, effectively filling the area between the house and the stable block. 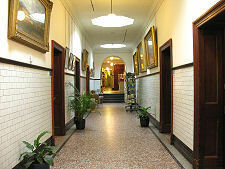 Internally, most of the ground floor is open to the public, as is part of the first floor and perhaps half of the basement. 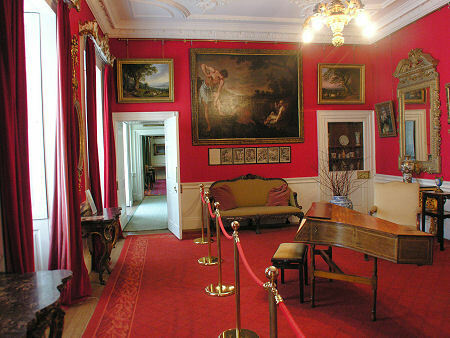 Pollok House's ground floor rooms are beautifully decorated and furnished, but surprisingly homely, with a larger number of smaller rooms than you might expect. The exceptions are the very impressive library and dining room: though in many ways the most attractive of the rooms is the music room. 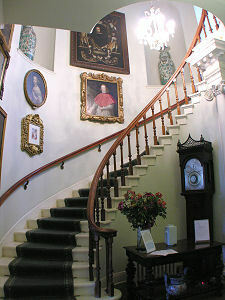 The curving main staircase connects the ground and first floors only, and on the latter you can view two of the rooms plus the art displayed on the large upper landing. 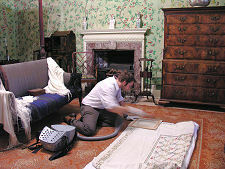 The basement was home to the service areas of the house, plus the accommodation for the male servants. Female servants' accommodation was on the second floor, along with the schoolroom and nursery, with all the floors linked together via a service staircase. 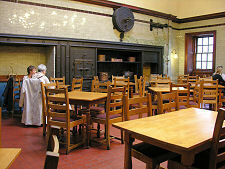 Visitors can explore a number of the rooms in the basement including the very evocative gun room, while the kitchen is now used as Pollok House's excellent restaurant and several other rooms house the small range of shops open to visitors.